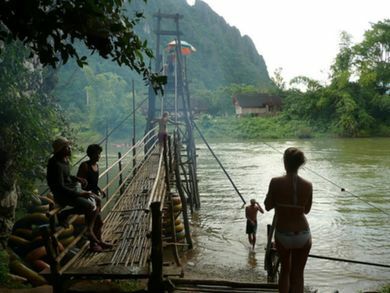 Vang Vieng (ວັງວຽງ)(also Vang Viang) is a riverside town in Central Laos. The town has been known as a party destination for years, and whilst this still remains more outdoor-oriented activities are now available such as mountain biking, trekking, kayaking, caving, swimming and rock climbing. Once little more than a bus stop on the long journey between Vientiane at the Thai border and the World Heritage Site of Luang Prabang, Vang Vieng has managed to become a destination in its own right – and rightfully so. While the town still isn't much more than three streets and a bus station, it is the stunning scenery of river and rock formations surrounding this place that will keep you dreaming of Laos long after you've settled back into real life. If you aren't into the rowdy party scene that seems to dominate this town's image, try to come in the off-season (Apr–Jun, Sep-Oct) and you'll have this place almost entirely to yourself. Many who have traveled around South East Asia have heard about tubing on the Nam Song River, an activity that long-dominated the town and its visitors. Originally, the bars catering to tubers along the river were opened up by hedonistic backpackers. At one time, as many as 20 bars lined the river, with pulsating music, drinking games and drug-fueled debauchery becoming the norm. However, after 27 tourists died while partying on the river in 2011, the local authorities clamped down on drugs, shut down many of the tubing bars, put restrictions on the volume of bar's music, and removed riverside swings and ‘death slides’. As of July 2015, five bars operate each day along the river on a two day rotation. However, those upstream bars still have a profound influence on the town itself, which has an atmosphere of lethargy by day and debauchery by night. In town, tourists sprawl out in the pillow-filled restaurants called ‘TV Bars’, watching re-runs of US sitcoms ‘Friends’ and ‘Family Guy’ until the sun goes down, and then party heavily until the early hours. Free alcohol is served at many of the tourist-oriented bars in town, providing hours of free drinking for the frugal backpacker. NOTE: While tubing has become much safer recently, be aware that in previous years roughly one tourist died every month while jumping into the river or tubing. Many more got severe injuries as there are many sharp rocks not visible under the water in many places along the river. Do not jump at all if you are drunk. It's very difficult to predict where you will land in the water while jumping and there are almost always some rocks nearby! Please be a conscientious traveler not discarding your rubbish to pollute the environment. If you notice fellow travelers attempting to discard their rubbish into the rivers and banks, give them the evil eye! Vang Vieng may have established itself as the exception to the rule that Laos doesn't have nightlife. It does have potential as a base for adventure tourism which attracts a few more sedate foreign sightseers. However, whilst the main attraction for many visitors remains the tubing, it is easy to avoid the party scene and use the town as a base to explore the surrounding countryside. Note: As of 2015, the tubing and party scene in Vang Vieng is absolutely nothing like it used to be a few years ago, when there were thousands of drunk/high youngsters at the dozens of bars tubing on the river every single day. Those days are well and truly over. Now there are only 4 or 5 bars and a few hundred people a day tubing on the river. It is rumored that the Lao government stepped in because of all the deaths and injuries happening on the river that were highly publicised in western media newspapers. So they closed almost all the riverside bars overnight to prevent Laos' international image in Vang Vieng being damaged any further. As such, most the bars in the town of Vang Vieng itself have gone out of business and more and more close every week. Do not go to Vang Vieng expecting wild full moon parties and a huge party scene, because this just doesn't happen anymore. That said, there are still a dozen or so bars still clinging to the town's party vibe past: Bucket booze, psytrance music, an Irish bar etc. To many, this is a welcome change. Vang Vieng is now quieter, like it used to be before the tubing really kicked off in the mid-2000's. So you can enjoy the numerous spectacular caves, lagoons, and adventure sports in the surrounding area without the all night raves and many drunk/high tubers severely injuring or killing themselves whilst tubing. Either way, don't be put off: Vang Vieng is one of the most beautifully scenic places in the region, if not the world, and there is plenty to do to warrant a week (or even more) here. Vang Vieng is on Highway #13 between Vientiane and Luang Prabang - by bus (road and bus conditions permitting) about 6-8 hrs from Luang Prabang, around 3-4 hr from Vientiane. Highway #13 is a two-lane road in poor condition except for a few bumps closer to the cities, nothing to worry about. The road between Vang Vieng and Luang Prabang is mountainous and boasts amazing scenery as well as worthwhile glimpses of Lao village life. The road between Vang Vieng and Vientiane is flatter and less interesting. Tickets for tourist buses and minivans can be purchased at almost every guesthouse and should include transport to the bus station. Buses from Vientiane cost about 50,000 kip (GBP4, €5, USD6). Minivans leave Vientiane all day and cost about 50,000 - 90,000 kip. The The Express VIP bus to Vientiane costs 70,000 kip (Sep 2016). Slower local buses to Vientiane without air conditioning run in the early morning (05:30-10:00) and cost about 40,000 kip for a 5 hour journey. The minivans and local buses leave Vientiane from the Northern Bus Station. The Northern Bus Station can be reached from the city by taking the number 8 bus, which can be flagged down along its route or can be caught at the Central Bus Station, downtown. The number 8 bus cost 5,000 kip as of September 2016. From Luang Prabang, VIP buses booked through agents in town cost 150,000 kip and minivans cost 120,000 kip (June 2012), you can purchase tickets directly from the Southern Bus Terminal, the VIP bus is 105,000 kip and minivan via the travel agent opposite is 110,000 kip (July 2013). Many guesthouses also sell bus tickets, however, be aware that they often call the normal local bus a minibus. These local busses are much slower (can take up to 8 or 9 hours, if you are unlucky). On the bus ticket, it says that it is 85,000 kip (January 2017) and at the bus station the sign says 95,000 kip. Expect to pay around 120,000 kip, if you buy it from a guesthouse (which then includes transport to the bus station). Also included in the price is a small lunch (sandwich or rice with curry). If you're susceptible to motion sickness you'll be much better off on the slower bus than the minivan but it does mean a longer transit time. Buses from Luang Prabang to Vang Vieng stop at the Northern Vang Vieng Bus Terminal which is 2km from the city centre, tuk tuk's can take you to town for 10,000 kip each. Get off at Friends bar as you come into town and explore from there otherwise your driver will take you to his/her preferred guest house. Taxi from Vientiane airport to Vang Vieng costs USD 90 (Jan. 2015), for which one shall buy a taxi ticket. It will take 3.5 hr without traffic jam or stop. AVIS has locations in Vientiane (downtown only - arrange free airport pickup ahead of time) and Luang Prabang (same). If you'd like to make the scenic drive independently and be able to stop and take in the scenery, two-day one-way rentals start around $200 (~$50/day with a good promo code + $100 one-way fee) + $40 gas (for the direct route). If you have more time, you could stop by the plain of jars too, which would perhaps add another day of rental and some more gas. Vientiane <-> Vang Vieng 3-3.5 hrs Vang Vieng <-> Luang Prabang 4.5-5 hrs (leisurely pace with multiple scenic stops). From Vientiane, buses will drop you off either at the old airstrip (from the Vietnam war, it's now just a giant gravel pad) and the tourist buses will drop you in front of a hotel on the main street in town. The airstrip is directly behind the main street, so in either case there is no need to take a tuk tuk or cyclo if you plan to stay in the main area of town. The island and bungalows along the river are about a 10 min walk away. Buses to and from the North of Laos leave from the new bus terminal 2 km North of town. Tuk tuks will want 20.000 kip per person (Feb 2018) for the short distance into town. When leaving Vang Vieng, transport to the bus station is usually included in the price of your ticket. Vang Vieng is so small that everything is easily reachable by foot. If you want to venture outside of town, bicycles are widely available and can be rented from hotels or local businesses. Most outfits charge 20,000 kip for a day's rental, however newer bikes in excellent repair may cost slightly more. There are few Motorcycle rentals available near the river bank and at the main street - good selection of scooters for instance at M/c Rental (across the street and about 50 m East from Whopping Burger). You can rent a small semi-automatic scooter for 40,000 (morning to evening time) - 60,000 (24 hour) kip. Some Chinese dirt bikes (small 125cc 100,000/150,000 kip or bigger 150cc 150,000/200,000 kip) can also be found. Petrol may not be included in the rental fee, so check before paying. If not included, it's an extra 10,000 kip (oct 2013) in a petrol station. Always check the condition of the bike and details of the contract before signing anything. At some places you will have to sign a contract which makes you responsible if something breaks or fails to function, even if it's normal wear and tear. If riding out of Vang Vieng to the surrounding villages, be very careful of buses, minivans and trucks, and take extra precautions against the poor road conditions. Gravel, potholes, mud puddles and other hazards litter the road, so it pays to keep your eyes on the road and not on the mountain scenery. Also you are not allowed by contract to go out of the Vang Vieng district, so don't count on renting a bike here to go on a longer tour of the district. But somewhere is possible to rent a bike and go all the way to Vientiane if you need to make a visa run for example. Several tuk tuks are also scattered around town. 10,000 kip per person will be plenty to get to anywhere within Vang Vieng - it's also the price you'll pay to get to the tubing bars irrespective of how many other people are on board. It's better to sort out exact change with fellow passengers as tuk tuk drivers are notorious for giving incorrect change. To rent a tuk-tuk for the day costs about 130,000-150,000 kip. The town and surroundings are the real attractions, including the rows of limestone karst mountains across the river to provide a stunning backdrop and is the setting for some impressive caves. Watch movies. The US TV-series Friends is shown at many restaurants, and seems to be very popular with the younger party crowd. High swings. Playing on the very high swings over the river and sliding on a slide. Be careful: perforated eardrums, broken ribs, foot injuries and permanent hearing damage are common injuries, and deaths are not unknown. The local hospital is not equipped to diagnose or treat these serious injuries - Vientiane has the closest, if spartan, ENT facility but no English speaking specialists, so you may have to travel to Udon Thani for treatment. You might have to rely on other tourists for rescue. Most of these swings and slides have been taken down. Hot Air Ballooning. A flight over the surrounding countryside with stunning views. The small shops scattered throughout Vang Vieng sell the standard assortment of snacks, trinkets, sunglasses, and bathing suits. The majority of tourists seem to leave with at least one T-shirt, vest or dress with "In the Tubing - Vang Vieng" emblazoned on it. Prices for tourist packages are quoted in both kip and US dollars. Restaurants, hotels, and pretty much everything else is priced in kip. Most places will accept kip, US dollars and Thai baht for larger purchases. There are many ATMs that now take all major credit cards but are known for running out of cash. Some tourists have reported only being able to use cards on the Maestro (Mastercard) network. But some reports that use VISA with no problem. BCEL-bank give a poor rate. LDB-bank give better. The Lao Development Bank changes money at good rates and processes cash advances. BCEL will also do cash advances on credit cards. The numerous TV restaurants are interchangeable and all have a similar theme. When it comes to wifi some offer it free, others sell access. Others offer access only at certain times only. They all have similar menus. A selection of Lao, American, Italian, Chinese and Thai food is normally fresh but often of indifferent quality and poorly executed. Small serves average 20,000-45,000 kip. For quick eats and late night snacks, numerous pancake and sandwich stalls dot the streets. But be careful, food hygiene may have been compromised by being in the heat all day and your gastro-intestinal system may react accordingly. The street running next to the river just to the west of the tube rental office has a few vendors selling large chicken and pork kebab skewers for 5,000 kip each. "Happy" or drug-filled delicacies are only offered at two or three restaurants now. 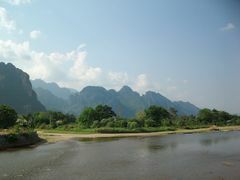 Vang Vieng is much less wild than it once was. Sae Lao Restaurant,. 500 meters before Blue Lagoon n°1. Local food, mains from 15-45k in April 2018. The restaurant is part of a project supporting education for kids from nearby villages. Staff works here to learn english and are happy to discuss with you if you want to. Vangvieng Thai / Happy Mango, (next door to Sakura Bar). Very good Thai food, extensive menu, mains from 25-55k in Feb 2018. Service is charming and attentive. Viman Thai German, The owner lived in Germany for 34 years and makes a terrific pork schnitzel (60k for regular size / 100k for giant size in Feb 2018). Thai curry also comes highly recommended. Slightly wider selection of beers than most places. Jungle Bar, (turn left at the fork by the tubing centre, beside TCK Tours). Good quality food, relaxed environment with cheap meals. Does not play Friends or Family guy. The friendly owner, Jackie, serves good fruit shakes, pizza and Pad Thai. Organic Farm Cafe. Original and interesting menu. Deep-fried mulberry leaves in honey for 15,000 kip. Goat cheese sandwich for 30,000 kip. Bamboo Tree Bar & Restaurant, (18.925137,102.449137) Offers a large menu with a wide variety of dishes from pizzas and pastas to authentic laos dishes and milkshakes. Happy Hour is from 6pm-10pm. Restaurant also offers free wifi (pw: 7766556688). Beerlao is available everywhere in Vang Vieng, but the drink of choice is a cheap plastic bucket filled with liquor and soft drinks. A bottle of Tiger Whisky costs the bar 10,000 kip, so around a third of a bottle goes into your bucket, normally with a choice of 7up or Pepsi, lime and Redbull. There are 4 main bars open along the river, the rest who did not have connections were abandoned (the 2nd bar is owned by the chief of police). Drugs are not sold along these river bars however balloons (nitrous oxide) are. There are a few local bars open further down the river but are pretty empty, if they have anyone in them at all. Tubing groups depart at 11am, 12pm, 1pm. You rent a tube from one of the two local tube places (owned by the same company/police). You pay more than you should for a tube and they say that you will get your security deposit back if you return the tube by 6:00 PM. You take a tuk-tuk with your tube to the first bar, Bar Zero. You drink there for a little bit, until it starts getting crowded, then people start to make their way to the river and tube to the next bar. This bar is very close to the starting bar and has a huge open area to hang out in. The following bar (Bar Two) is the most fun bar of the four. There is a basketball court with water shooting out of the backboards, and there art sculptures everywhere. You then get in a tube and go to the last bar. By this time, it is around 4:00 PM - 5:00 PM. Don't bother leaving for the town after 5:15 PM. If you do try to make it to town before the 6:00 PM deadline to get your tube deposit back, you are out of luck. The tuk-tuk drivers make sure you don't get back in time. They then split the profits with the tube company. Just enjoy the bar and come back after 6:00 PM, when the bar starts to die down. Avoid the stress and know from the beginning that you aren't getting your deposit back. It's a great time, just enjoy the river. Westerners employed by the bars for food and accommodation hand out free shots and organise drinking games to encourage you to stick around; many will also offer promotions to encourage you to their visit twin bars in town later in the evening. The competition among the night bars is so fierce that the deals are often genuinely pretty amazing, and if you time it right you can go from bar to bar for free buckets and cheap deals. Too much alcohol or "special" or "happy" shakes which can contain cannabis, magic mushrooms or any manner of substance are not a good idea if you plan on going back in the river. These are sold at the bars if you ask for them. The only things that aren't there anymore are the death swings, death slides, and zip lines. If the water level is too low, these activities wouldn't be happening anyway. You would be surprised how shallow the water is at parts. Beer and buckets are available all around Vang Vieng in bars covered with Christmas lights (including all the "TV restaurants") and the buckets are usually very strong because Lao whisky is cheaper than soft drinks. There's no shortage of choice but a distinct lack of diversity, especially if you're looking for live music. Moon Bar, (On the other side of the old airstrip). A club for locals on the other side of the airstrip They play Dnb, dubstep and pop. Open from 11:30 till 4ish, depending on the numbers. There are now a couple of halfway-decent midrange "hotels" and attempts at boutique style residences. Generally though, double rooms go for US$6-15, make sure you see the room (and bathroom!) before paying. More local, low-key (which is pretty low-key in Vang Vieng to start with) places are by the market and more shiny set ups are on the main road. The party crowd tend to advocate a bungalow on the island, but expect it to be too noisy if you want to sleep during the night. Most guesthouses have large TV-viewing areas, practically coated in the Southeast Asia signature triangular cushions, where they serve food. But be forewarned - you'll be hard pressed to find a place screening something other than the US sitcoms "Friends" and "Family Guy". Spicy Laos Guesthouse is a bit hard to find, it is all the way down the road with the tubing. Thousands of tourists pass through Vang Vieng without incident every year, but the combination of outdoor activities, drink and drugs still makes it one of South East Asia's most dangerous destinations for travellers. Even the town's main street can injure the unwary traveller: you'll need to watch out for the large holes in the pavement through to the drainage ditch below as they are not fenced off. The medical care available in the town's hospital is rudimentary at best - for serious injuries you'll want to go to Vientiane, or better still, Thailand. Floating downstream at a sedate pace in an inflated rubber tube shouldn't be a dangerous activity, provided you leave enough time to get back before darkness falls. What raises the danger level is the bars offering a combination of strong alcoholic drinks and high platforms to jump from. Whilst you may find that risk reduced somewhat by the dismantling of some of Vang Vieng's infamous ziplines, swings and slides following recent deaths, you're still going to have use your common sense. If you want to jump into the river, be very careful about where you do so - the Nam Song isn't very deep except where the bar staff have cleared rocks from the river bed. Don't even think of pushing others in: at least one person has died that way. Needless to say, if the alcohol or drugs you've consumed may impair your ability to swim or climb out, don't enter the water, even on a rubber tube. Remember whisky buckets can be deceptively strong and their effects can kick in very quickly. The river current is strong in many places - even those who are sober should avoid sapping their strength by swimming against it. It should be easy enough to swim across to shallower water instead. Historically accepted drugs, such as marijuana, mushrooms and opium are freely available in many bars and restaurants around town. The majority of bars have 'magic menus' with most of these things on. Consuming these drugs on the premises is fairly safe, although drugs are illegal in Laos and nothing is totally safe. Southeast Asian 'crystal meth' is known as yabba and is available in both pill (red in color) and smokeable forms. Formerly legal in Thailand as a way for longhall lorry drivers to keep awake. Yabba is an epidemic due to its highly addictive qualities. Manufactured locally, the drug can be cut with any number of substances. Aside from the drugs already mentioned it is inadvisable to attempt to purchase any other substances not freely available on the 'magic menus' around town. The dangers of most drugs should be well known to visitors, and additionally there is also a police presence. Plain-clothed policemen frequently take unsuspecting tourists to the local police station for smoking a joint. The usual outcome of this involves having your passport seized until you cough up a hefty fine typically of 3-5 million kip. Once the fine is paid however the matter is generally taken no further and the passport returned; however, the punishment will depend on the officer you are dealing with. Several local policemen are friendly with restauranteurs who sell opium, mushrooms, cannabis and yaba. Customers are not harassed at these establishments: the police wait until they leave. Some of the same police own guesthouses near the island. Never surrender your passport if you can help it, and often the best way out of the situation is simply to pay. A minor annoyance around Vang Vieng (refered too by locals and long time residents as the Vang Vieng plague) is conjunctivitis, or 'Pink Eye'. This is a viral, and sometimes bacterial, infection which can be caught from the river or other tubers. The onset of pink eye is often felt as an unnatural tiredness, and inability to properly fully open your eyes. If you sense this, or have been sharing buckets with people with pink eyes or wearing sunglasses at night, the best thing to do is shell out for eyedrops as soon as possible to prevent the onset. If this should happen late at night, be aware that eye drops alone should cost a maximum of 20,000 kip. Some of the late night pharmacies attempt to extort tourists, charging up to 5x the normal price for eyedrops. As well as eye drops, general antibiotics are available from any pharmacy. In some cases eye drops will cause an intense stinging sensation, this can be soothed with an eye bath formula also available at pharmacies. Of course the sensible solution would be to rest your eyes and ease the drinking, but Vang Vieng's non-stop party atmosphere makes this a hard option for most. Should your pink eye last longer than a week you should probably seek proper medical advice, and stop drinking all that Tiger Whisky to give your body time to heal. When tubing home late, taxi boats may offer to take you back for around 10k each. Howeber, they may just take you to somewhere else, stop and refuse to continue. If you don't want to pay the tuk tuk, the only way to get home is to walk. Luang Prabang and Vientiane are normally the next stop, depending on the direction you're heading in. In both cases remember, as always, to not leave anything valuable in your luggage, the bus staff has a plenty of time to go through your things, and they do. You can book trips all the way to Bangkok (via Vientiane) but since you'll change mode of transport at least once anyway it's just as easy to arrange this trip at your own pace. Buses to Vietnam are notorious for taking even longer than expected and being a really unpleasant experience. Buses also go directly from Vang Vieng bus station to Udon Thani bus station. Bus departs at 9.30am (more like 10am) and schedulied to arrive at 5pm, though this may be on conservative. 100,000 kip for tickets if bought at the bus station. Cheap tickets for all the destinations can be bought at the MART (local supermarket) instead of all the different companies on the street (that charge up to 60,000kip more). All the companies use the same bus company settled in Vientiane (not available for booking during bank holidays). Internet speed and reliability is variable but not bad by Laos standards. Most guesthouses and restaraunts offer free wifi. Buy yourself a Laos SIM card with data for 50,000 kip or less. This page was last edited on 22 April 2019, at 07:21.